Under the flights, or migration, of birds mean their resettlement or relocation directly associated with changes in environmental and feeding conditions, as well as the nature of reproduction. Each species of migratory birds flies away and returns within a certain period. However, their wintering grounds remain constant. They usually overwinter in places where the natural conditions correspond to the conditions of life at home. Geese, ducks, cranes belong to migrating birds. The main reason for their flight is the food. Birds quickly consume the energy obtained from the diet because of things they have is often much. Thus, when the ground freezes and food becomes extremely difficult to find, especially insectivorous birds, many of them travel to warmer climes. And as soon as the young learn to fly, begins the autumn migration of birds. Before leaving, they often gather in flocks, then disperse over long distances.The cranes spend the winter on the sprawling territories. The cranes that live in the European part of Russia leaving to spend the winter in Spain and Algeria, living in Western Siberia fly to India, in Eastern Siberia to southern China. Black crane nesting in Japan and Eastern Siberia, carries out flights through Mongolia and Northern China to South-East Asia, where it spends all winter. 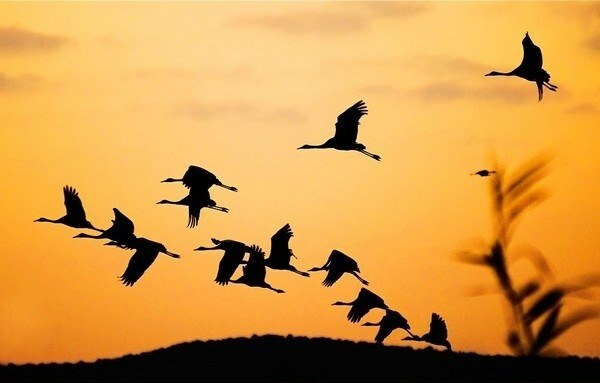 During migration, most of the cranes are flying at the altitude of 600-1000 metres and above. The flights in the daytime is about 400 km. In September starts the ducks and geese. Consider the birds in the bulk of winter in the Caucasus, in the South of the Caspian, Azov and Black seas, the Mediterranean, Asia Minor, Iran, India, and in the lower Danube and on the shores of the Baltic sea and the British Isles. Some species of ducks, geese overwinter on the territory of the former Soviet republics of Turkmenistan, Azerbaijan, Black sea, lake Issyk-Kul, located in Kyrgyzstan. In designated areas in winter accumulates a large number of birds, their protection has established a special reserves. During seasonal flights of geese are gaining a lot of height. They fly in flocks, wedge or in the rare case the line. The number of birds in a single flock is different from a few pieces of birds to several hundred. The swallows are beautiful little birds, bright-eyed inhabitants of urban and rural landscapes. Every spring they arrive, hatching and in the fall they leave their homes. Where to go to spend the winter these birds? Swallows is a tireless aerial hunters of insects. They are impossible to confuse with anyone else, as they have distinctive features: blue-black "tie", a light breast and forked tail. Flight speed 60 km/h, but the trajectory is very changeable and unpredictable. A large number of these graceful birds can be seen close to grazing herds, around which the hovering mosquitoes, midges, horseflies. These insects form the basis of the diet of adults and Chicks. For the nests the swallows choose a vertical surface: in the wild, cliff, cliffs rivers, in settlements – eaves, roofs, etc Building material for their homes they gather on the banks of the reservoirs.The area of distribution of species of the family lastoctober is large enough. They do not occur only in the regions of the far North. The time of arrival of swallows to nest depends on the geographical location of the region: in the southern areas they appear in April, and in Northern and middle latitudes in may. In the winter these birds fly one of the first in August-September. Usually moved in large flocks in the daytime, although there are exceptions.A few centuries ago thought that swallows hibernate at the bottom of reservoirs, buried in the mud, and with the onset of spring out on the surface. This erroneous opinion was formed due to the fact that during the flight a large number of birds stop for the night in the coastal thickets. Through the banding was tracked to the main ways of migration of swallows. In addition, using this method scientists were able to establish the exact wintering grounds of specific populations. For example, species breeding in Eastern Europe, heading South and East, Republic of South Africa, and individuals from Central and Western Europe and fly to Thailand, Southeast Asia, Africa, sub-Saharan Africa (Liberia, Congo and others). Swallows make the long flights among the birds of passerine – 9-12 thousand miles. The distance they overcome in 2-3 months. 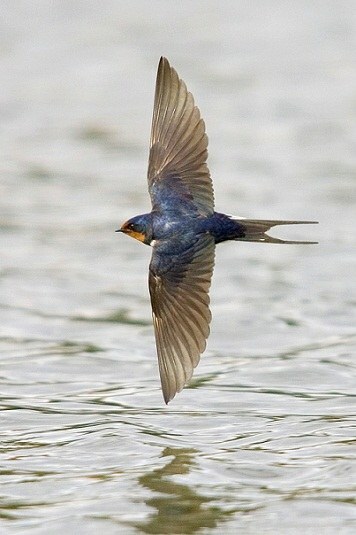 The record for long-haul flights are sea swallows – Sterne, flying annually about 40 000 km.